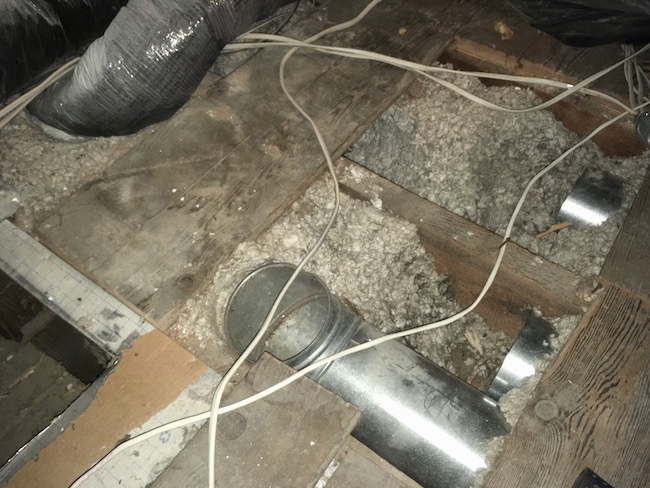 Before—The gray fiberglass dust that used to accumulate on the floors before the blown in fiberglass in the attic was removed from the home. We had figured out decades ago that carpets creat poor indoor air quality, but it took longer to figure out the fiberglass issue. Had we had carpets in the home the fiberglass dust would have been harder to see. Before—The gray fiberglass dust on the backside of the air vent before the fiberglass was removed from the attic floor. 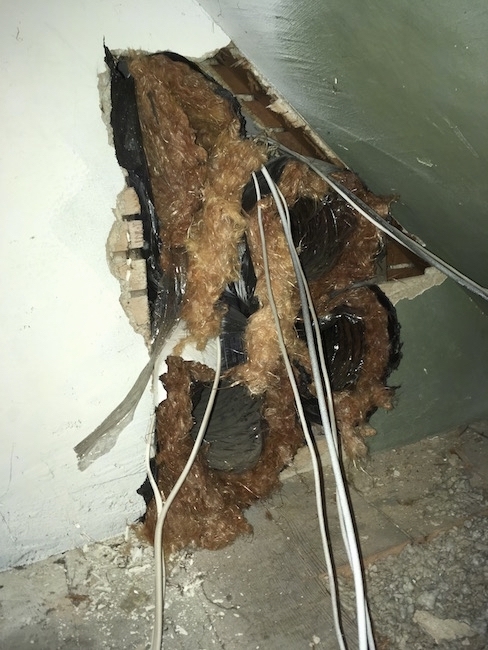 The fiberglass was getting sucked into the return and blown around the house. 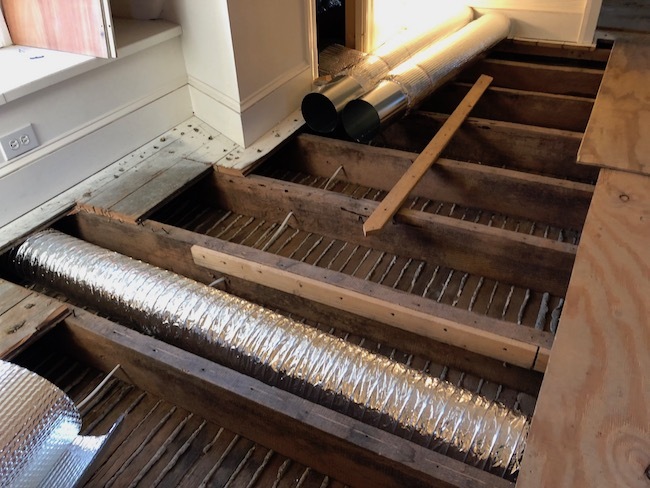 Before—This is the attic floor with the floor boards removed exposing the blown in fiberglass that was getting all over the home. After—We removed all of the blown in loose fiberglass under the attic floor. This is a shot of the new clean, fiberglass free air vents being installed. Bubble wrap is being used where insulated vents are necessary. A much cleaner choice than shredded glass. 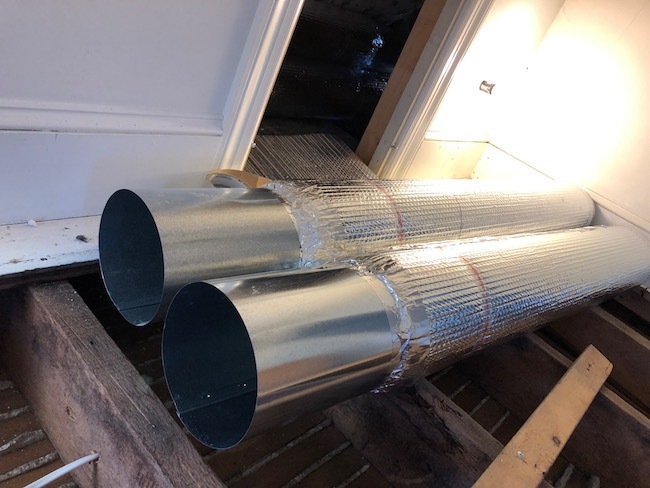 Before—One of the flex ducts used in the heater and AC system installed in 2001. That is fiberglass wrapped around the duct. The plastic is meant to hold in the microscopic glass, but over the years the plastic ages and gets tears in it exposing the fiberglass to the air. 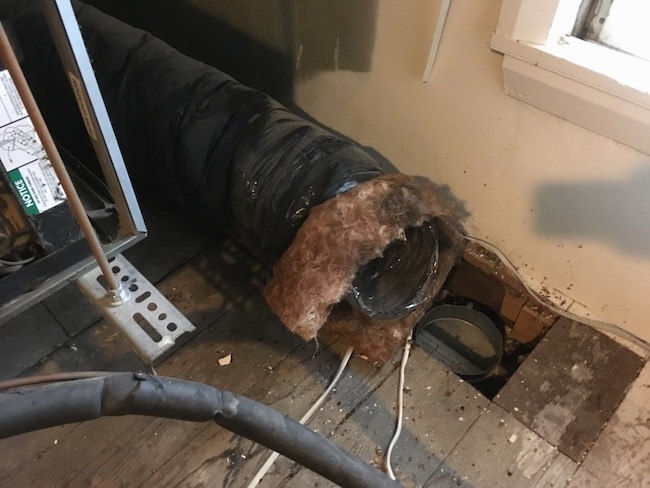 These fiberglass flex ducts are also supposed to be sealed off with duct tape, but I notice that contractors often leave the ends exposed and do not properly seal off the glass fibers. 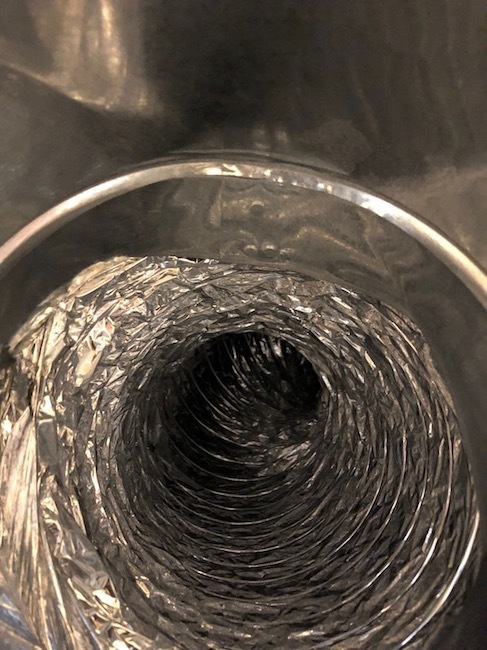 After—We replaced the fiberglass wrapped flex ducts with clean metal ducts wrapped in plastic bubble wrap. Unlike fiberglass wrapped ducts, if the bubble wrap gets a tear in it, it will not contaminate the air. Before—Flex ducts behind the wall. The orange-brown stuff hanging off the end of the duct is fiberglass. These ducts were installed in 2001. After—We replaced those dirty ducts with clean metal and foil, wrapped in bubble wrap where insulation was necessary.